Look, I know it’s terrible, okay? That much I’m not going to debate. Alien: Resurrection is a clattering mess. It’s a sequel no-one asked for, that has to jump through a tortured series of hoops before it can even justify its own narrative existence, at which point it fails to stick the landing, falls flat on its face, and suffers enough resulting concussion to think that underwater CG xenomorphs might look convincing enough to charge people money to look at in 1997. Resurrection is, fittingly, the hybrid mess of a great many (often interesting) ideas utterly failing to gel with each other. Its script contains some genuinely decent, unnerving concepts, but the ‘dark comedy’ direction clashes horribly. Ripley’s moral ambiguity is a great means of building tension, but there’s so little tension elsewhere that the movie fails to build to anything particularly powerful. The idea of gene-spliced Alien DNA should be the starting point for a carnival of body-horror excess – a Cronenberg version of the subject matter could have been amazing – but ultimately results in little more than a baby-faced Alien goblin that dies rather rapidly, albeit in a decidedly horrible way, leaving the audience a tad confused as to who it’s meant to be sympathising with. But what if that lack of coherence could work to its advantage? What if we embraced the film’s incoherent, mash-up nature in a framework that justified its inconsistency, so that we could stop focusing on the messy construction, and instead pay more attention to the themes at play in the movie’s multitudinous, clashing ideas? I’ve been thinking about this quite a lot recently. And I realised a while ago that if we separate the core concepts from the goofy execution, there’s actually a heck of a good distillation of the whole series’ subtextual conceits hidden away in there. Or at least there is if we focus on Ripley’s personal character journey during the first three movies. Because by the end of the series there is a hell of a lot going on. Few film franchise protagonists evolve and grow as much as Ellen Ripley does between Alien and Alien 3. If there were a retrospective Oscar for ‘Best Long-Term Performance in a Franchise’, it would have to have Sigourney Weaver’s face carved into its tiny gold head. In every film, she becomes a new but entirely believable iteration of herself, in direct response to the changing circumstances of each movie, and crucially, the aftermath of what she has gone through previously. It’s generally kept just under the surface, but ye gods, she’s a character with baggage. The first movie sees her forced to rapidly grow or die, required to rise up from her mid-level crew position to become a strong, stubborn, and ingenious survivor. She’s not specially equipped for this role. She’s not blessed with inhuman, action-hero bravery, nor does she possess superhuman capabilities. Everything she uses to get through the ordeal, she finds by digging deep. But this is just the start. In Aliens, she must deal with the personal fallout from that. She has natural PTSD to manage, before even considering getting involved again. And she has to deal with what the Alien has taken away from her beyond the obvious bodycount. She’s now a woman out of place and out of time, ripped from the very life she fought so hard to save, and the daughter she left behind. She might have stayed alive, but she lost all the trappings of her life regardless, which is why she takes on Newt as an adoptive daughter and fights so hard to protect her. She gets a temporary win, taking on a new, hard-bitten, vengeful warrior persona now that she has something new and important to fight for – to take back, in fact – but her success doesn’t last. 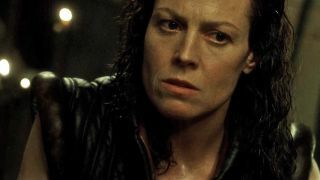 Alien 3, then, is her taking stock of her ultimate loss and the nihilistic nature of the universe. This is a Ripley who knows that however hard she fights, whatever she becomes, it might never be enough. Chaos can always veto her victories. Thus, Alien 3 is more of a slow-burn character drama, with Ripley processing what she’s been through, what she’s had to become, and the nature of her relationship with the Alien itself. Because, after having her life and persona defined by the beast for so long, she shares a strange kind of intimacy with it in Alien 3. She makes an explicit statement of this in the movie ("You've been in my life so long, I can't remember anything else"), but it’s implicit throughout. And for all of the discordant cacophony in Alien: Resurrection, all of this stuff, the whole damn series’ primary character arc, is crammed in. It’s an unfocused, tonally shambolic mess, but by accident or design it does – at least in abstraction – surmise Ripley’s whole journey. So I got thinking. What if there was a way to make the fourth film a kind of epilogue to the main trilogy? What if we could separate its silliness away from the ‘real’ story, while keeping its subtext as a kind of commentary on where Ripley is at by the end? And then I realised we can. We just need to imagine that Alien: Resurrection is a fever dream Ripley has while she’s falling into the smelting pit to die at the end of Alien 3. No, I wasn’t sure if it would work at first either, but it totally does. Trust me. Take the basic conceit of Ripley’s revival via cloning for instance. On the surface, it’s a lame, slightly desperate way to get a dead protagonist back for a sequel, but if we apply dream logic, then it’s the wish-fulfillment of a woman forced to die before she’s finished, when she still has so much to regain and put right. As for Clone Ripley’s gene-spliced nature, living as she is as a hybrid of human and xenomorph, that’s the dying Ripley’s expression of her changed nature, a physical personification of what she’s been turned into by her journey, and an attempt to take control of it in an empowered format. It's no coincidence that her tunic shoulders give her a silhouette that echoes the xenomorph's body-shape. And it’s also an admission of her isolation. Clone Ripley has traits of both human and Alien, but isn’t really either. Real Ripley, in parallel, has been steadily shifted sideways from her original humanity, by xenomorph and corporate monster alike, and by the end of Alien 3 simply cannot continue to live a normal life. At this point there would be no way back, even if she didn’t have to die. The theme continues as Resurrection’s Ripley discovers and incinerates the previous, failed clones, each one a broken monstrosity, in some way explicitly dominated by Alien DNA. As a manifestation of Real Ripley’s mind, this is the dying Ellen looking back at and rejecting her own earlier, failed selves – the ones who fought and beat the Alien but eventually lost to it anyway – with pity and disgust, their defeats represented by the xenomorph physiology overtaking their helpless forms. Ripley’s deeper anxieties take shape as we explore the Aliens in Resurrection, as well as the supporting cast. Winona Ryder’s Call is key in the latter group, personifying the traits, tropes, and qualities of some of the most important people in Ripley’s past. Most obviously, Call eventually becomes another proxy daughter (despite a fair degree of aggression between the two early on), representing Ripley’s desire to return to a normal life. But unlike any before her, she’s the daughter who got to grow up. Ripley lost her biological daughter, Amanda, when she was still a child, and Newt remained frozen in childhood as well, dying in hypersleep after Aliens. Thus, Call represents the future of the mother/daughter relationship that Ripley never got to experience, and knows she never will. It’s important to note Call’s synthetic status here as well. She’s literally a simulated daughter, Ripley’s subconscious acknowledgement of her ongoing search for a replacement Amanda. And given the additional resilience of synthetics (Call herself survived a major android cull, and recovers from being shot in the movie), as well as the trusted capability Ripley found in Bishop, it’s entirely understandable that Ripley might construct Call this way, to imagine a stronger, ‘safer’ counterpart, after losing so much in this regard. It's also notable that Call's initial intent in Resurrection is to kill Clone Ripley and stop the rebreeding of the xenomorphs, which makes her very much a daughter following in her mother's footsteps. As for the Aliens themselves, there’s a whole lot going on. The goofy psychic link that Clone Ripley enjoys with the xenomorphs can be seen as further wish fulfilment, as Real Ripley, (having grown exponentially in mental strength over the years, while remaining liable to be torn apart in a physical confrontation) finally exerts real, dominant control over the creatures. The scene in which she subdues an Alien, before tearing out its inner jaw and wearing it as a trophy, is ridiculously cartoonish if taken on surface reading. But as the real Ripley dreaming about finally tipping the balance of physical power in match to her mental resilience, it makes a whole lot of sense. And then of course there’s the Alien Queen and the Newborn. The former, with its bastardised human reproductive system (genetically ‘stolen’ from Ripley during the cloning and gene-splicing process) is a blunt, nightmare-logic metaphor for the motherhood the creatures have robbed her of through their incursion into her life. And the creature that spawns from this, the childlike, big-eyed, toddling abomination that affectionately sees Ripley as its parent, is a kind of ‘final straw’ moment, almost a testing final temptation that forces her to draw a line under the whole mess. The Newborn is a xeno-tainted parody of childhood (and therefore the parental ideal), a version of Ripley’s ‘normal life’ aspirations too ruined by the Aliens to be viable any further. She’s sympathetic toward it, but she knows that it has to die – just as she has to kill her hopes and die in the real world, in order to protect humanity. And so she destroys the creature, fittingly just as the final Alien embryo in the real world is birthed into a fiery death from her hallucinating body. In her dreamscape she’s voluntarily said goodbye to her last hope of a biological connection, but in doing so – in resisting the temptation of further life in a xeno-poisoned world - she has maintained her embattled humanity to the end. And in doing that, she finally gets to return to Earth, her real-life dream for the last few decades. And she gets to take Call with her. The planet may be a wreck (at least in the Special Edition), but there’s finally a kind of peace as she looks out across that landscape. And here, there’s also a climactic reconciliation with her complete, three-film journey. Ripley’s final line, “I’m a stranger here myself”, is a calm admission that she’s now no longer the Ellen Ripley who left on the Nostromo, but rather an alternative version, forged by the life that came from that voyage. Earth was the home of the Ripley she would have been, not the one she was forced to become. She had to learn to let go of that Ripley for the sake of a greater good, but now, at the moment of a selfless, martyr’s death in the furnaces of Fury 161, it seems she might finally be okay with that. Hear Me Out is GR's regular exploration, extrapolation, and expansion on the biggest and best movie fan theories and alternative takes around. From whole new interpretations, to critical angles you hadn't thought of, it's your home for the weirder side of film. Looking for more? Check out last week’s case for why Ghostbusters 2 makes far more sense if everyone's dead.